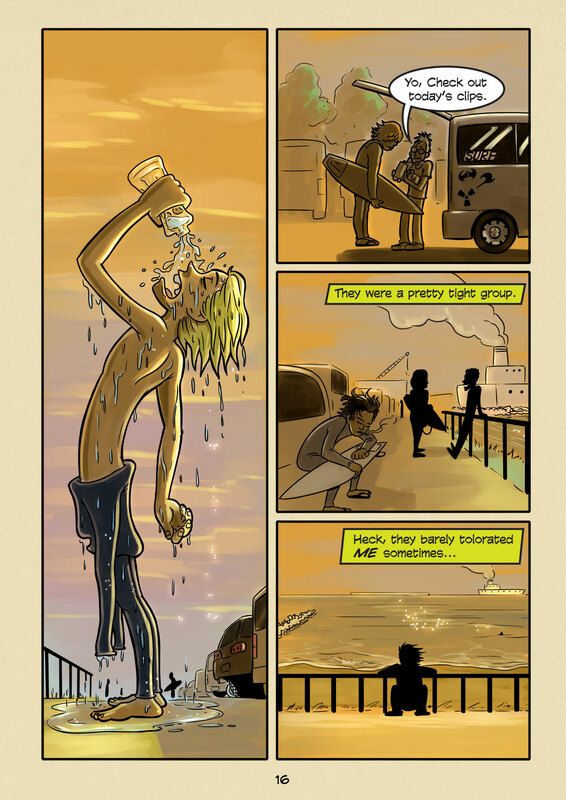 Sunset (#016) | Web comic "Surfer Joe"
Nothing beats hanging out watching the sunset after a good surf. I’m more of an early morning surfer so I rarely get the opportunity to watch the sunset at the beach. When I do it means I have a free afternoon with nothing that needs my attention(at least nothing pressing). Maybe it’s why I like sunsets so much. Makes me feel like I’ve wasted my day… in a good way. This page was kind of a hard one to make. I think there is an abrupt shift in time of day from the previous page. Maybe trying to make a smoother transition would be nice, I could insert a panel of the sun setting or something. If this was animation I would probably do something along those lines. A lot of times I have to make these pages pretty quickly, so I need to learn to trust my decision making and move on to the next page. No time to second guess, just enough to act. Looking at my layouts coming up it’s looking like Chapter 1 is going to finish around page 25. By then the ground work for the story should be apparent. Thanks for reading, as always!